How many times do you remind your kids every day to get their stuff done and keep track of their things? 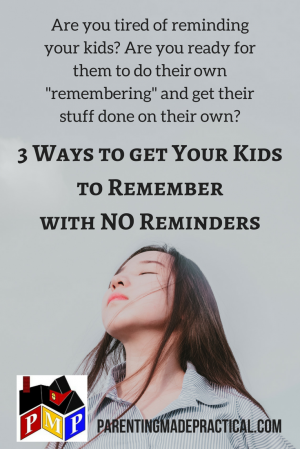 Do you think your kids can’t remember on their own, or do they not remember because they don’t want to? Our answer is the same to all these questions. Your kids can remember. The reason they don’t remember to get things done is because you don’t require them to. You have trained your kids to wait to be reminded. Your kids don’t remember because they don’t have to when they can count on you to do their “remembering” for them. For consequences to work they must be painful. Trust us; taking away their phone for an hour is not Taking it away for a week is. Take away what they misused. Think outside the box. They spoke to you disrespectfully? Take away their freedom to talk. Caleb doesn’t get his homework done? Let his teacher deal with it. Or, if you homeschool he loses the privilege of doing anything else until it is. Our kids schooled until bedtime while their siblings were having fun. They schooled all day Saturday after their chores were finished and Sunday after church. They learned to keep up with their schoolwork. When Evan can’t get everything together he needs for school he goes without. He didn’t get that permission slip for the field trip to you for your signature. Oh well, he doesn’t get to go. He forgets the shoes he needs for basketball practice? He sits practice out. If that means he doesn’t get to play in the next game, he can figure out how to make that up to the coach. Praise and encourage them when they get their stuff done with no reminders. When praise and encouragement are used effectively, they do wonders in the life of your child. Stop reminding and your children will start remembering! Reminding is a habit that is hard for moms to break, but you can do it! A terrific book, “What Every Child Should Know Along the Way” gives guidelines, preschool through college age on what you can expect your children to be able to do without reminding. It can be purchased at our online bookstore. Joey and I have written a book titled, “Taming the Lecture Bug and Getting Your Kids to Think” that talks about breaking the reminding habit as well.